Probably one of the most popular exhibitions at the moment is “Lowry and the Painting of Modern Life” at Tate Britain. Lowry’s work has had an interesting reception, historically, I think: he is remarkably popular, appealing to a wide range of people, and this combined with his instantly recognisable style means that he can be looked down upon by art historians as perhaps not a serious artist, possibly a little bit twee. 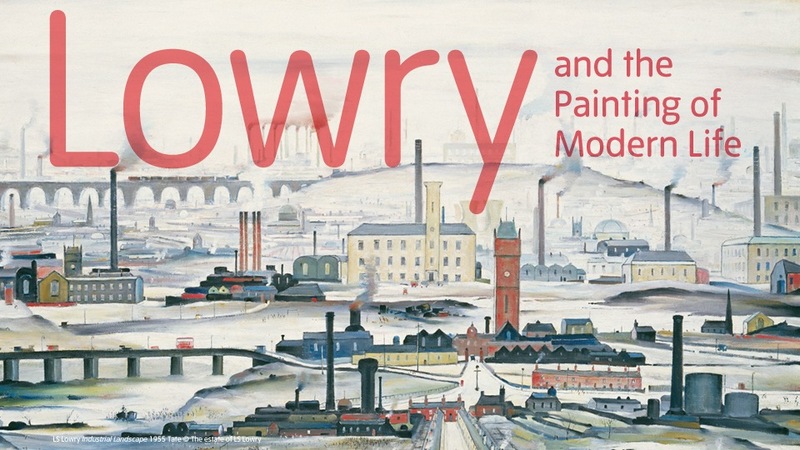 This exhibition does much to rectify that perception, I think, by contextualising Lowry’s work and emphasising its historical significance and Lowry’s own engagement with working-class life. 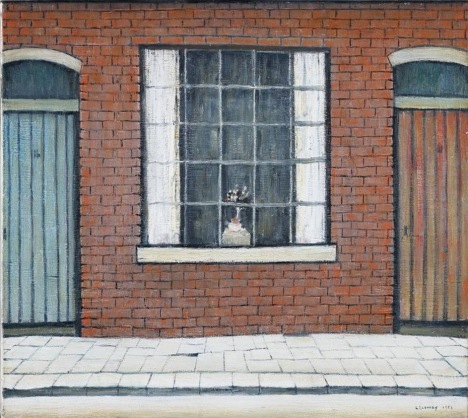 The exhibition constructs Lowry as an artist of anti-sentiment, focussed on the reality of industrial life and urban people, and even a cursory glance at his paintings confirms this. Lowry saw art as a necessity for understanding and engaging with modern life, and there is no doubt that he relentlessly depicts the small tragedies and hardships of the industrial Northern working class in a way which offers pathos without sentiment. He does not seem to comment, but represents with empathy instead. This is not an uplifting exhibition, though it is an enjoyable and informative one. Even paintings which seem to offer no immediate comment are filled with pathos, such as “Flowers in a Window”, which seems to offer a metaphor for a bleak respectability in a barren urban landscape. And “Britain at Play” might sound like a happier image, yet no one is smiling. “Going to the Match” is filled with tiny, serious people bent over with the weight of the occasion. The style, the details and the images are appealing, but there is a deep seriousness behind the paintings. Looking around the rooms, there is a lot of black and white, subdued colours and a few startling, large buildings which loom out of some paintings. Interestingly, these are mostly churches, perhaps suggesting something about the long shadow of faith in working-class communities. 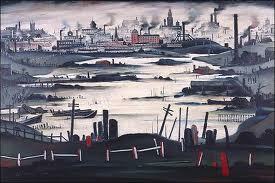 Lowry’s focus is firmly on the working people, then, their lives, environments and hardships. When grander houses are depicted, they are bleak and unwelcoming, as in the “House in Eccles Old Road”, where the building seems closed off and remote from its surroundings. The more one looks at Lowry’s work, the more every painting seems to be a commentary on class, and this exhibition emphasises this significant aspect of Lowry’s thought by quotations and books that relate to this aspect of his work, from Orwell’s The Road to Wigan Pier to Robert Roberts’ later boo k The Classic Slum: Salford Life in the First Quarter of the Century. These narratives of hardship and poverty illuminate the tragedies and pathos of Lowry’s world, from the sad departure of a child in “The Fever Van” to “Pit Tragedy” and “An Accident”. Lowry himself said “I only deal with poverty. Always with gloom.” Yet it is notable how beautiful he makes this gloom seem: while art is necessary to illuminate life’s issues, it is also necessary to illuminate our lives with its beauty, and Lowry is not simply a moralist. What he shows us in his paintings may often be tragic, but it has a stark and rhythmic beauty which is compelling. The exhibition is divided into sections, including “The Ideas of Modern Life”, “Street Life” etc. I was very interested in the “Ruined Landscapes” section, which, combined with the final “Industrial Landscapes”, offer a rather forward-thinking approach: Lowry as ecologist, concerned about the damage that heavy industry and overpopulation is causing to the planet. The paintings show stinking swamps, abandoned buildings and derelict machinery, a product of his earlier landscapes in which not one scene escapes a smoking factory chimney lurking somewhere in the background. The paintings that are dif ferent – with more colour, for example, such as the Welsh landscapes, or different types of figures such as in “The Cripples”, stand out from the others, but in fact I think I prefer his starker, gloomier works for their simple beauty. A painting I had not come across before was “Necropolis”, depicting the final home of the men and women who wander mournfully in and out of his paintings. There is a peace here which I don’t see in his other paintings, which is a comment on his skill at conjuring atmosphere. But like his other paintings, it is both grim and fascinating, beautiful yet awkwardly ugly. 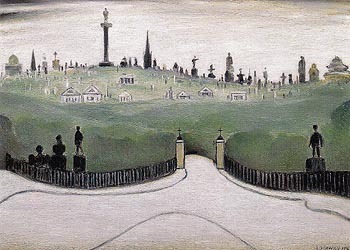 Looking at Lowry is like watching our own civilisation’s demise: you know it’s true, and you can’t stop looking. I try not to – I do like to make up my own mind, but in this instance I think they did a good job and I agree with them! I am afraid the exhibition reduces Lowry to a social commentator on the British society, a documentary film maker, while he was a much bigger philosopher of modern life, albeit often misunderstood and misinterpreted. I agree he was much more than just a social commentator, but I felt that many visitors wouldn’t be aware of this and the exhibition highlighted that well without excluding his larger vision. I suppose everyone sees it differently though! This Lowry exhibition offers a contextual perspective that refutes the oft-used ‘twee’ tag, according to @serena_t.